The quartet of nimble-fingered designers unstitched the dress. One loop after another they loosened the threads, separating from the rest of the piece a rectangular blue cotton fabric. It had red borders on the top and bottom. Emblazoned in the center is a crest: a ring of leaves encircling two men, one light and one dark-skinned. They each propped a tool on their shoulders: an axe and a paddle. Jostled under their feet are the words SUB UMBRA FLOREO. It’s Latin for, “Under the shade I flourish.” It’s the flag of Belize. 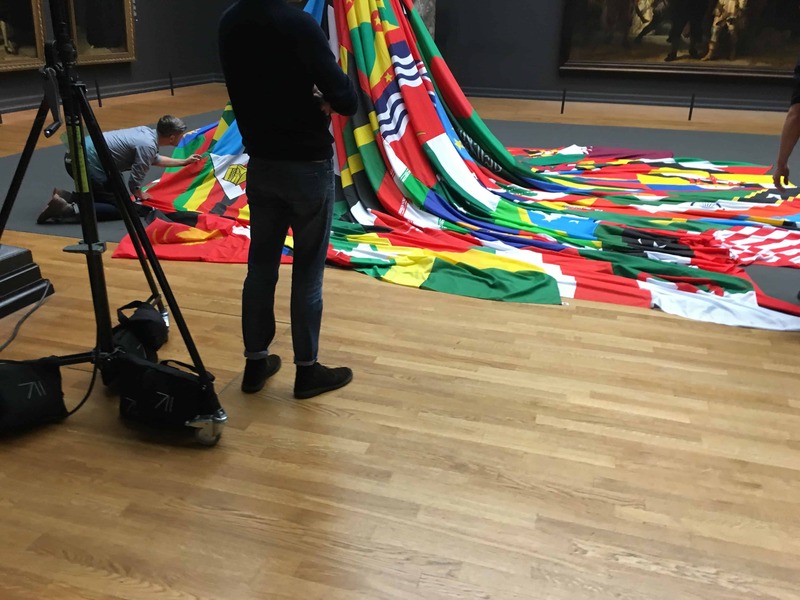 And they’ve just removed it from the dress made from an ensemble of 72 flags. The four designers created the dress as a statement against discrimination of the LGBTQI community. The bodice (the top of the dress) is the Amsterdam city flag. 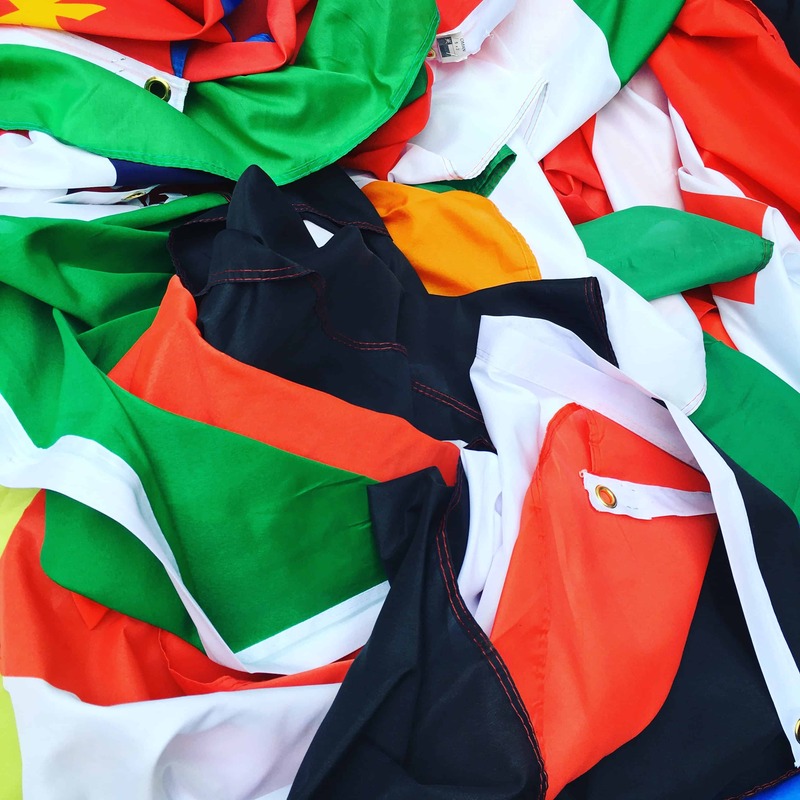 The bottom of the dress comprises flags from 72 countries that outlaw homosexuality or homosexual acts. At its full width, the dress measures 16 meters (52 feet) in diameter. On 10 August, 2016, the Supreme Court of Belize, in a radical departure from a dated draconian law, decriminalized homosexuality. The dress had no place for Belize anymore. So, they replaced it with a rainbow flag. The dress, which made its first public appearance on 5 August, 2016, at Amsterdam’s inaugural LGBT Freedom Ceremony, was modeled by Valentijn de Hingh. The 26-year-old Dutch transgender model was the befitting personification of the dress. Her success as a transgender model bookended the designers’ message. The four tight-knit designers — Mattijs van Bergen, Arnout van Krimpen, Jochem Kaan, and Oeri van Woezik — are all artists by trade. Their familiarity with each other was as equally pivotal as their crafty hands. The whole project, according to Mattijs, took just under a week to complete. In countries like Libya, Somalia, and Iran, homosexuality is punishable by death — with some countries exacting death by stoning. For others, like Malaysia, Egypt, and Barbados, it’s imprisonment. On top of that, the dress also bestows a voice to the belittled and the bullied. In some countries, even ones void of discriminating laws, deviant individuals are psychologically castrated by societal norms. 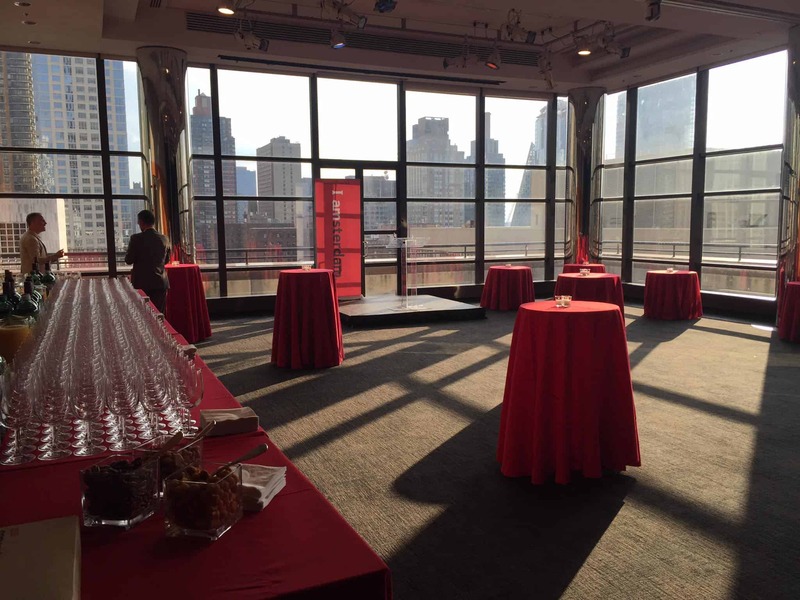 Their voices are drowned out by boisterous conservative chatter inherited from generations before them. The Netherlands — where the four designers were born and raised — is considered to be one of the most progressive in the world when it comes to LGBT rights. In 1987, they erected the world’s first monument to commemorate homosexuals who were persecuted and killed during World War II. 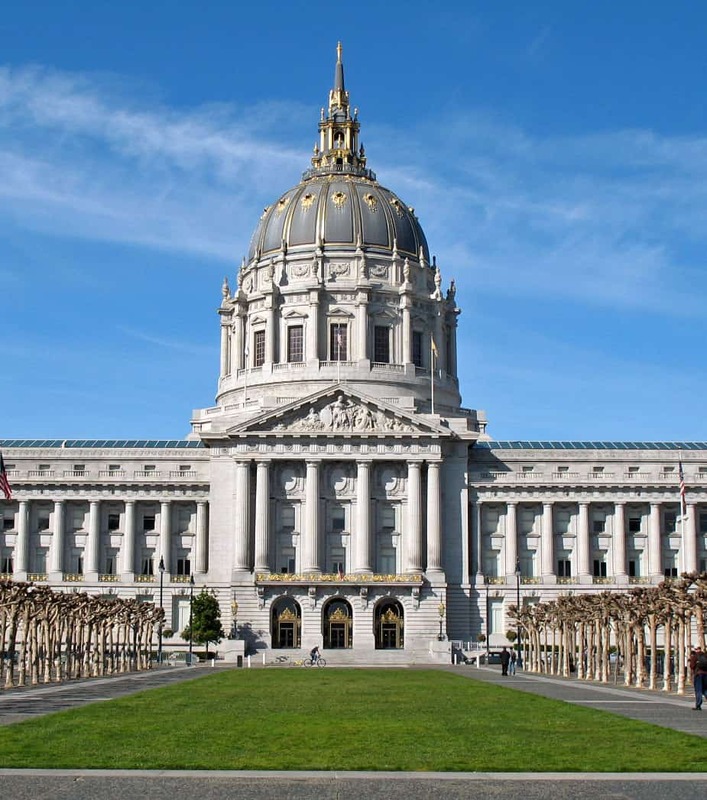 “We also became the first country to legalize gay marriage in 2001. The progressiveness of the Netherlands needs no embellishments,” said 44-year-old sculptural and spatial artist Oeri. That notwithstanding, discrimination, like pests, is resilient. It slips through cracks. “Coming out for anyone is difficult. Coming to terms with one’s sexuality is not easy. In secondary school, I was bullied for being gay until I came out. As soon as I came out, I had nothing to hide anymore, and so I had nothing to be bullied about,” said Mattijs, who grew up in Beuningen, a small village in the Netherlands. “From that time, I became a much stronger person,” he said. And that’s what the dress represents. 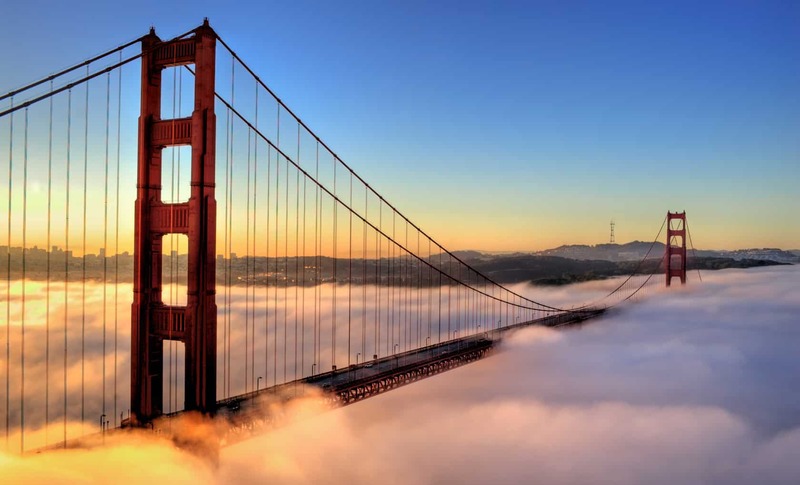 At least, it’s one of the things it represents — overcoming discrimination. But the reasons behind this dress are manifold. 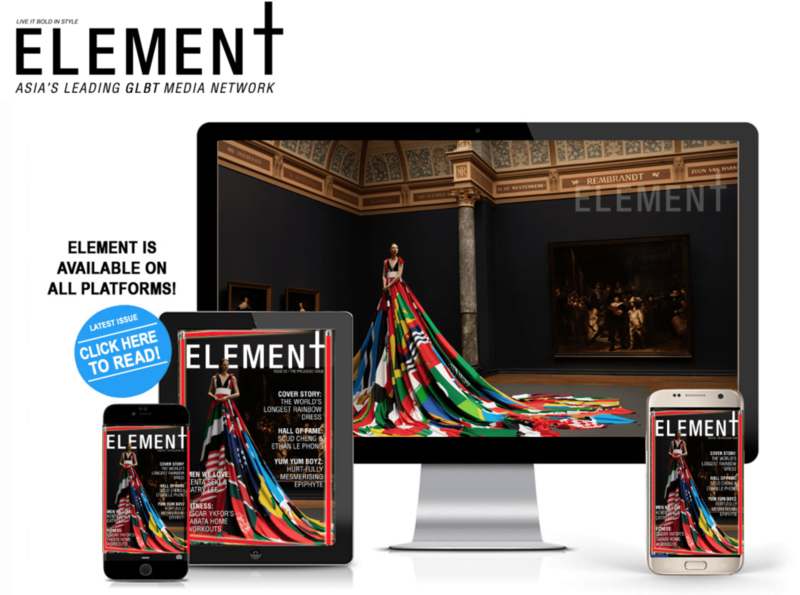 “Our project seeks to raise awareness on several levels; on the vast challenges that LGBTQI-refugees have to deal with on a daily basis, on the fact that over a third of the world’s countries still have active anti-LGBT legislation in some form or another,” said 47-year-old art teacher Arnout. This dress has an important message. When celebrations of Pride are taking place around the UK, it’s easy to forget – just for a moment – that there are still so many places where people aren’t free to be gay. So let this dress remind us of all the work that still needs to be done. 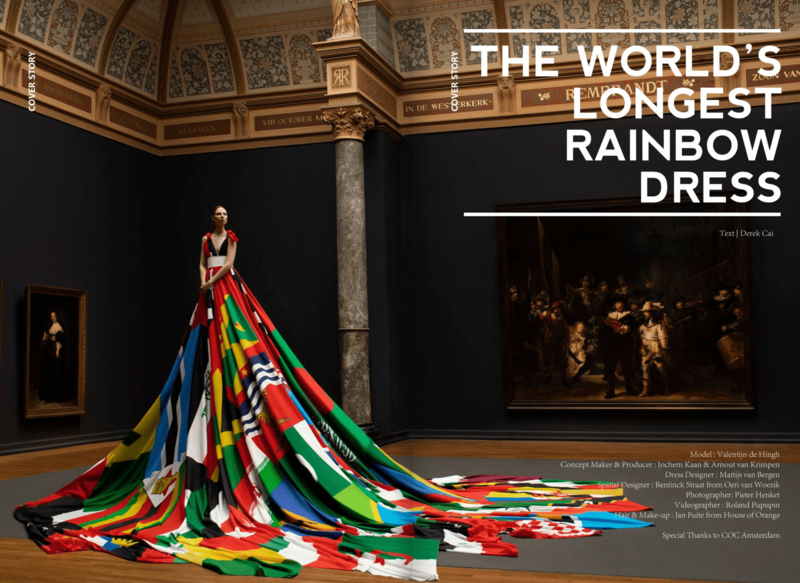 As part of this year’s Europride, designer Matjis van Bergen and artist Oeri van Woezik created a rainbow bright dress made with the flags of the 72 countries in which homosexuality is still banned. They chose Valentijn de Hingh – the first transgender woman to be signed by IMG models and Europride’s first trans ambassador – to model the dress, in an incredible portrait captured by photographer Pieter Henket. That portrait has now been shared thousands of times. Clearly it fulfilling its mission of showing everyone just how far we still have to go. But the dress isn’t complete. It’s not going to live on forever as a reminder of all the intolerance in the world. Valentijn says that each country that changes its legislation on homosexuality will have their flag in the dress changed to a rainbow flag. The ultimate goal? An entirely rainbow dress. So come on, world. Let’s hurry up and change things. Trans Model Valentijn de Hingh Wears Dress Made Of Flags From Countries Where Homosexuality Is A Crime. 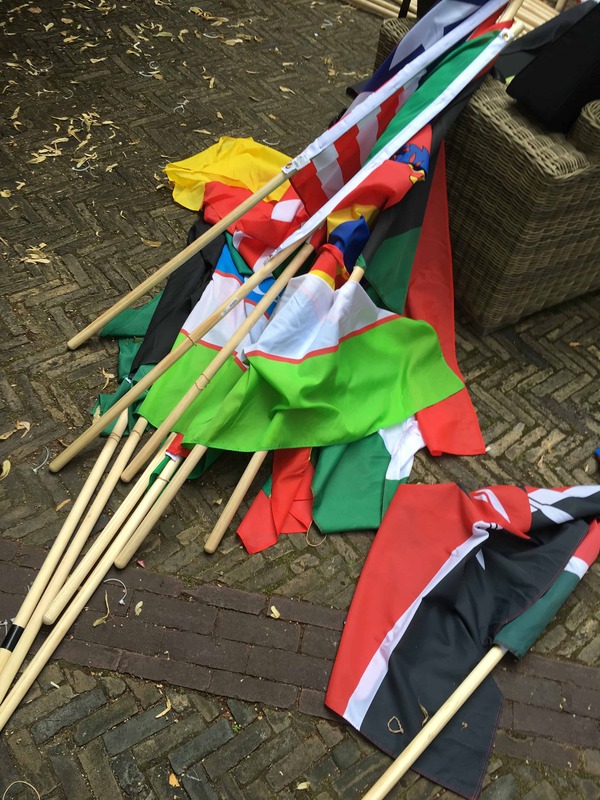 De Hingh was an ambassador this weekend at EuroPride in Amsterdam.To bring attention to the plight of LGBT people around the world, trans model Valentijn de Hingh donned a dress made of flags from the 72 countries where homosexuality is illegal. De Hingh, 26, posed in the dress at the famous Rijksmuseum in Amsterdam, which played host to EuroPride this weekend. The dress was crafted by Dutch designer Mattijs van Bergen, while arresting image was shot by photographer Pieter Henke. De Hingh, who is Dutch, was EuroPride’s first transgender ambassador. She started modeling in 2008 and has walked the runway for Comme des Garçons and Maison Martin Margiela, among others, and is the first transgender person ever to have been represented by IMG Models. Die schönste Anklage gegen Homophobie! Der niederländische Modedesigner Mattijs van Bergen hat zusammen mit dem Künstler Oeri Woezik ein beeindruckenes Statement gegen die Diskriminierung von Lesben und Schwulen in aller Welt gesetzt – ihr “Amsterdam Rainbow Dress” nähten sie aus den Flaggen der 72 Länder, die Homosexualität verbieten. 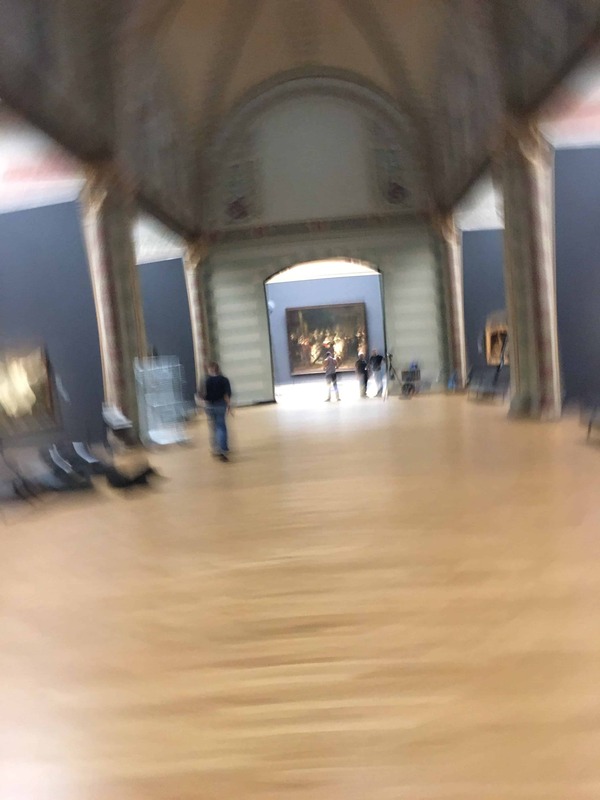 Im Rahmen des EuroPride in der Grachtenstadt setzte der Fotograf Pieter Henke das schöne Kleid der Schande im Rijksmuseum in Szene – direkt vor dem berühmten Rembrandt-Gemälde “Die Nachtwache”. Getragen wird es vom bekannten Transgender-Model Valentijn de Hingh. Dutch Fashion Designer Mattijs van Bergen and spatial designer Oeri van Woezik created an Amsterdam Rainbow Dress in collaboration with COC Amsterdam and showcased it on Friday. The dress is designed to highlight the rights of LGBT community at a global level. Adorned by a transgender model Valentijn de Hingh, the bodice of the dress has Amsterdam flag on it as it is known to be the safest place for LGBT people. And, the layers of the gown are made up of flags of 72 countries where LGBT has no rights or it is illegal. 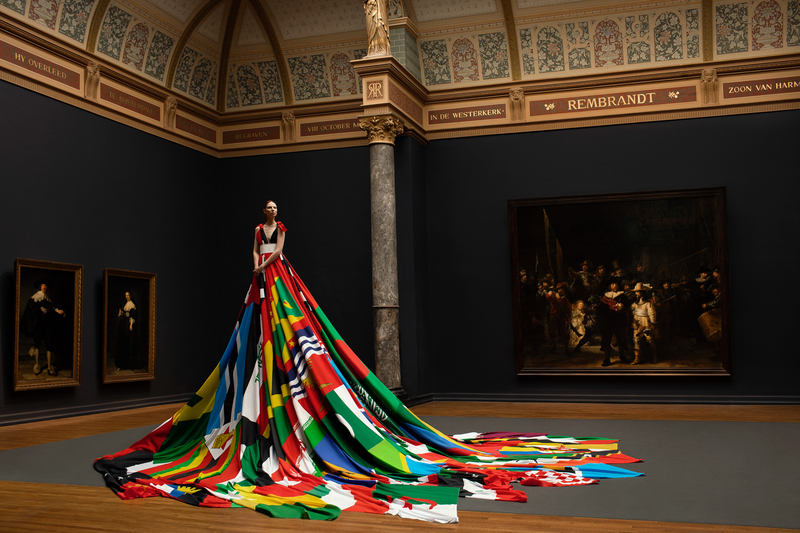 Trans model Valentijn de Hingh is helping to bring attention to the plight of LGBT people around the world with a stunning dress made of flags from the 72 countries where homosexuality is illegal. “During the opening walk of euro pride in Amsterdam 2 weeks ago, 72 flags of 72 different countries where homosexuality is against the law were present, in 12 of these countries you still get the death penalty for being gay,” writes Pieter Henket, the photographer who captured the stunning dress. 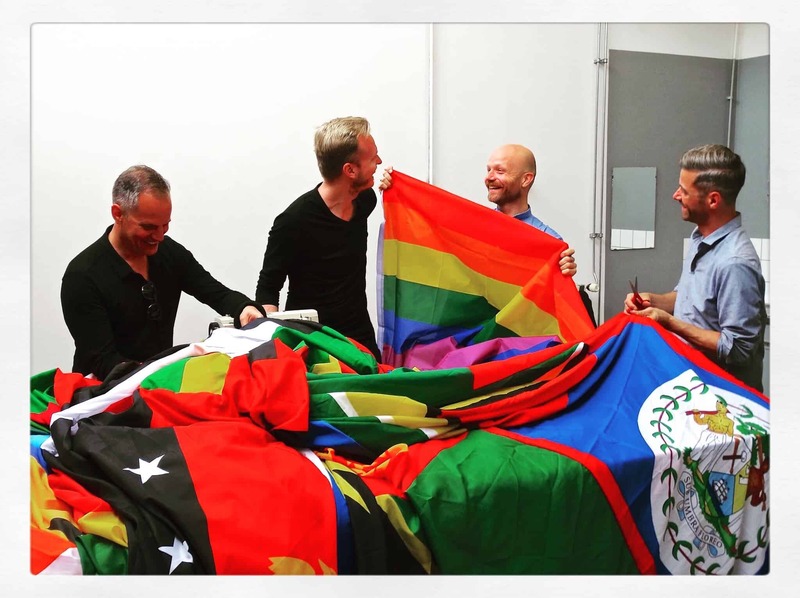 “The COC (Dutch organization for LGBT men and women) collected these flags and together with Fashion designer Matthijs van Bergen and artist Oeri van Woezik they decided to make these flags into a giant rainbow dress,” writes the Dutch photographer who currently lives in New York City. De Hingh, who became the first transgender person ever to have been represented by IMG Models, posed in the dress at the famous Rijksmuseum in Amsterdam, which played host to EuroPride this weekend. The 26-year-old Dutch model was EuroPride’s first transgender ambassador.